Like who doesn’t want to read any of these four? Awesome! I’m expecting loads from all four of them. I hope not to be disappointed. These should all give me lots of food for thought. Which new releases are you anticipating? “My father, James Witherspoon, is a bigamist. He was already married ten years when he first clamped eyes on my mother.” (Silver Sparrow, p. 3) Wow! What an incredibly powerful way to start this novel. This story is set in the 80s in Atlanta in a middle class African-American neighborhood. James Witherspoon has two wives and two daughters. They live in different neighborhoods and have no knowledge of each other, until one day Dana becomes aware that she is the secret. She is her father’s second daughter. The story develops when a forbidden friendship between the two daughters leads to the truth and unfortunately destruction. The story is recounted from the first person. Part 1 is Dana Lynn Yarboro’s story and the second part is Bunny Chaurisse Witherspoon’s story. They were about the same length in pages but I found the voice of Dana more impressionable and endearing. The writing was delicate, powerful, and at times I felt as if I was eavesdropping on the characters. The scenes are edifying and depict the emotions and characters deeply. I enjoyed reading the story and it flowed delicately each page I turned. Although, I found the ending a little frustrating, I anticipated it and was anxious about it. Actually, there was something about the writing style that reminded me a little of Toni Morrison. It ‘s the sentimental way that emotions and situations are described. I gave this book four stars because it was a very interesting read from an African-American woman writer that many people may have not heard of before. I happened upon this book while browsing a blog called black girl lost in a book. You can check out her blog at http://naysue.wordpress.com/. 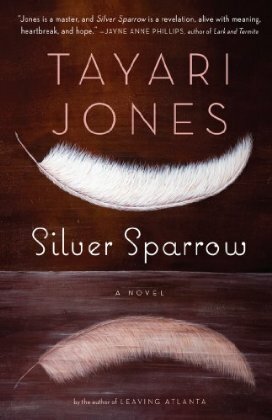 Silver Sparrow was on her notable release list and I thought I’d give it a go. I’m glad I did. Tayari Jones is an intelligent storyteller and has a bright writing future ahead. She is a native of Atlanta and studied at Spellman College, Arizona State University, and the University of Iowa. She was also a winner of the Hurston/Wright Legacy Award for Debut Fiction in 2003. While Silver Sparrow was her third novel, she also wrote Leaving Atlanta her first novel, which tells a fictionalized story of the Atlanta child murders that happened from 1979 to 1981. Her second novel was called The Untelling and it recounts the story of a woman trying to overcome her difficult past. I urge you all to take a look at Tayari Jones because we will surely be hearing more about her as well as reading more from her in the future.